One of the reasons why I’m an Apple user is because I appreciate good service. When I dropped my Macbook one evening and my hard drive stopped working, it was incredibly easy to schedule an appointment with the Genius Bar at my local Apple store. They fixed my hard drive and recovered my data within 30 minutes and away I went. Peace of mind is worth the premium, which is why I’m a fan of technology-assisted financial advisory firms such as Personal Capital. Personal Capital not only has the best free financial tools online to track your finances, they also have a sophisticated digital wealthy advisory business with human financial advisors to provide financial guidance. But what if you have time and know how to upgrade your RAM, swap out your hard drive, and do your own diagnostics? (I remember doing all that as a teenager.) Then going the robo-advisor route may very well be a good option because their fees are even lower. There’s just no person to guide you through life’s myriad changes. Robo-advisors, aka algorithmic advisors deploy sophisticated investment algorithms to help invest your money in the best risk-adjusted way possible. You essentially fill out a profile about yourself and the algorithm will go to work to recommend and implement their recommendations for you. I used to have a hard time trusting computers to do anything for me. But after spending 13 years covering some of the largest mutual funds and hedge funds in America, it’s clear that algorithmic investing, or more commonly known as quantitative investing or scientific investing have done extremely well. For example, Bridgewater Associates run by Ray Dalio is the largest hedge fund in the world with over $120 billion dollars and it’s a macro quantitative fund with tremendous performance. Famous hedge funds run by George Soros, David Tepper, and Steve A. Cohen can’t even compare. A good quant fund or algorithmic advisor is all about having good people. At the end of the day, the investment variables are created by people and continuously tested for maximum returns. Spending time understanding people’s backgrounds and then trusting them to do the right thing is a huge part of letting other people run your money. After all, the reason why you want someone else investing your money is because your expertise lies elsewhere, and you’ve got more interesting things to do with your time. In this article, I’d like to provide a brief primer on the benefits of using a robo-advisor to manage your money. There are two main robo-advisors that exist today: Wealthfront and Betterment. My focus will be on Wealthfront as they are based right here in the SF Bay Area and pioneered the robo-advisor movement starting in 2008. The core offering by robo-advisors is very similar to investing in a target-date fund. A target-date fund works by taking your desired retirement age (without taking into account risk appetite), and slowly shifting your stock/bond split more heavily to bonds as you approach your retirement date. Wealthfront needs investors to transfer over their assets in order to create those target-date fund accounts, and they can only see the assets they hold. Once you give them your assets, they allocate them to create a balanced portfolio, but only within that account. That’s a valuable service, but for investors with multiple accounts already, it may not be the right solution. Wealthfront charges 0.25% of your assets over the first 5K. Wealthfront manages about $10 billion of client’s money and generally targets the more sophisticated investor. They’ve since lowered their minimum to $500, and the first $10,000 managed is free. This is pretty huge for investors who just want to try things out at no cost. Vanguard’s target-date funds charge 0.17%. The expense ratio for Wells Fargo’s index-based target-date funds ranges from an average of 0.35% to 1.63% per year. For the two classes of Fidelity’s actively managed Freedom funds, the average annual expense ratios are 0.57% and 0.60%. In order to get a balanced recommendation for your investment portfolio, it’s important for the robo-advisor to see what your overall financial picture looks like. For example, let’s say you own a lot of real estate like I do (~35% of my net worth). If you believe in modern portfolio theory, then it’s important to take into account the other parts of your net worth when filling out Wealthfront’s simple questionnaire in the beginning for them to assess what type of portfolio they will construct based on your answers. Here’s a sample portfolio that Wealthfront will create for me after inputting my answers. I’m a relatively high risk tolerant investor who is happy to buy more stocks if there is a 10% price correction. A sample Wealthfront portfolio. Click to sign up and see what portfolio they’d recommend for you. Both digital wealth advisors do tax-loss harvesting, but they do it in different ways. 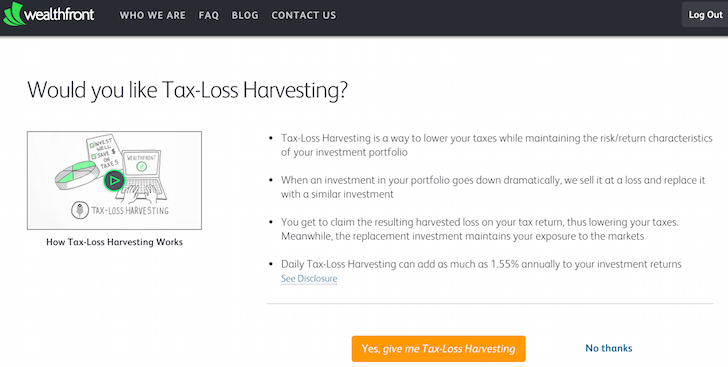 Wealthfront conducts tax-loss harvesting on the assets you’ve given them from the moment you create an account. They handle future losses. Accounts at any other brokerage can be moved to Fidelity or TDAmeritrade without a tax hit. It’s called a “transfer in kind,” and it means you don’t have to sell what you have and buy something else. This approach logically seems better since it looks at your overall wealth. Since none of the robo-advisors can actively manage money in a 401k, the majority just ignore it. Wealthfront, on the other hand, looks at your entire portfolio holistically. They manage around your 401k with the assets you choose to give them, and also show you how to cut fees and rebalance within your portfolio (without charging on the assets in the 401k). It’s the extra step that makes sure you have a fully diversified portfolio – not just a single diversified account. Given that 401(k)s account for most of Americans’ retirement savings, Wealthfront’s ability to work with them makes it much more valuable. 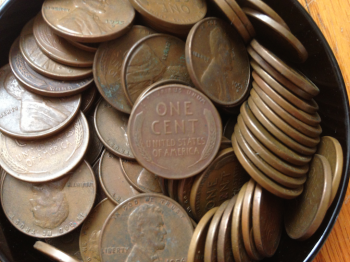 The algorithms Wealthfront have are built on data going back over a 100 years where available. Their back testing has been done in some of the most extreme financial corrections and have held up well so far. Wealthfront’s algorithms seek out commission-free ETFs within your broker to eliminate trading costs. iShares funds trade commission free at Fidelity has 100s of commission free ETFs, as two examples. Since they aren’t trading underlying equities, trading costs are rarely if ever an issue. Wealthfront has a team of seasoned CFAs and PhDs who create and maintain the algorithms as well as an academic council who help inform us of financial developments. Simon Moore, CFA, MBA our Chief Investment Officer is an economics graduate from Oxford University and published author. Wealthfront is an excellent choice for those who want the lowest fees and can’t be bothered with actively managing their money themselves once they’ve gone through the discovery process. In the long run, it is very hard to outperform any index, therefore, the key is to pay the lowest fees possible while being invested in the market. Wealthfront charges $0 in fees for the first $5,000 using my special invite link, only 0.25% for any money over $5,000, and only have a $500 minimum to get started. Invest your idle money cheaply, instead of letting it lose purchasing power due to inflation. You don’t even need to fund your account to see what type of portfolio they’ll construct for you based off your risk tolerance. About the Author: Sam began investing his own money ever since he opened an online brokerage account online in 1995. Sam loved investing so much that he decided to make a career out of investing by spending the next 13 years after college working at Goldman Sachs and Credit Suisse Group. During this time, Sam received his MBA from UC Berkeley with a focus on finance and real estate. He also became Series 7 and Series 63 registered. In 2012, Sam was able to retire at the age of 34 largely due to his investments that now generate roughly $200,000 a year in passive income. He spends time playing tennis, hanging out with family, consulting for leading fintech companies in the Bay Area. So they can’t advise on my fidelity 401k. But if I open a fidelity account for 10k they will manage that money (10k) and give me free guidance on my fidelity 401k? So this makes sense IF you weren’t starting from scratch. But what if you’re starting from scratch? I’m going to retire (well, quit working at one job, anyway) with $400K in a 401K. That 401K has extremely limited choices and I plan to move it all out and plop it into one of these types of robo-advisers. Given that, it seems like FA’s “watching outside accounts” doesn’t do me any good; and given the amount involved, it seems like Betterment‘s 0.15 fee beats the heck out of FA’s 0.5 fee. So the real question for a neophyte like me (there’s a reason I want to use these services) is which service is going to have the best paradigm behind it (they’re all going to trade slightly differently based on the humans programming the computers in the first place) and does that fee difference make enough difference to give Betterment the edge? Greetings. If you had 10K to invest today and adding $15 k per month with a 10 year time frame, relatively aggressive to save for a house – what approach would you employ. Assuming emergency fund, retirement in order and no debt. Reviewed betterment, jemstep, fortune advisor and also considered target date vanguard and vanguard life strategy. Leaning towards Fortune advisor – is there anyway to compare returns historically over last 3, 5 and 10 years? Enjoy your site, actively track market but results, results, results is the bottom line on how I make the final call. I’m fairly new to your blog, but have really been enjoying it since a friend recommended it, and I am currently reading it in chronological order (started on page 141, up to page 113). I recently invested some money with Betterment, as I am quite intrigued by the algorithmic robo-approach to optimal investing. In the course of my research, I came across an article/analysis of theirs on emergency funds, which argued that instead of the traditional $X in a savings account, $1.3X invested in a betterment account with a 40% S&P500/60% 5yr T-bills ratio is a far better choice over a 5 year period. Their analysis then plots returns on this theoretical portfolio for every 5 year period starting 1955, compared to $X in the bank. I can certainly see that my current safety fund making 0.90 APY in an AmEx “High Yield” savings account is slowing losing ground to inflation over time, but on the flip side, that is a small price to pay for the cushion to not cut into any other investments (possibly at the worst possible time) in a crisis. What are your thoughts on investing a safety fund, or any type of cash that you’d like to remain liquid, in this manner? This seems like a good use of technology. Why not use what computers do very well. Using an algorithm to help you better manage your investments sounds good if you know what to do with the information. The more information the better. Interesting article. However, I don’t really get the point of using a robo-advisor. If the goal is to essentially create a target-date fund why not just get a vanguard target date fund and save on the costs of the middle man? FA actually sounds decent since it takes into consideration your 401k. Majority of Americans don’t invest/save more than $17500 a year so Betterment and Wealthfront seem to be completely pointless to most. FA is also nice since it would eliminate the need for them to con clients into investing outside their 401k, if the get paid advising that too. It must do a great job at finding cheap funds to get 12 assets classes on 360k portfolio to 0.15% ER. I would assume all index? But in your case does it really make sense to switch from a 0.22% to a 0.15% + 0.5%? I’m pretty sure you knew that your portfolio wasn’t diversified and didn’t need a robo-investor to tell you that. I also think their claim that to have beat the S&P 500 interesting. Must have more young investors than old with a low % of bonds. Be interesting how long they can make that claim for. I guess if your really want to take no part in your investments/savings than FA is probably one of the better options out there. By the way what’s your USTA rating? Are you done with Personal Capital? They do something similar, no? I’m still consulting for PC. FutureAdvisor is a algorithmic only advisor with no human advisors. Personal Capital is often incorrectly grouped in the Robo-advisor category as they employee a team of human financial advisors in SF and Denver. PC’s minimum is $100,000. FA’s minimum is $10,000. A slightly different demographic, although PC’s app is free for all to use. An intense amount of work obviously went into this article. I commend you for that. I must admit that even though I am still a proponent for Vanguard funds for those that prefer an off-hands approach, I am still impressed by the affordability of these new-ish online advisors. You’re paying more than if you did the research yourself, but you’re also getting better tools for analysis I suppose. I don’t use a robo-advisor, but admittedly I had no idea there was something this sophisticated out there – FutureAdvisor looks amazing from what you’ve shown above! Getting a cold, hard opinion on your risk exposure would be pretty valuable – I know I often mistakenly assume my portfolio is ‘safe’ just because I’m confident about each individual investment. Shame they don’t cater for Australian residents – I’d definitely be keen to give it a trial. That’s pretty neat FutureAdvisor goes to the client instead of having to port all your assets to them. But how do they actually make the trades and rebalance for you if all your assets are still with you? Do you give them a right to trade on your behalf? I like their free grade report and optimization / recommendation analysis. Hi Joe – We take limited trading control of your accounts which lets us make the trades and balances on your behalf. Since we custodian with TD and Fidelity, it makes for a pretty simple process if you’re already using them! What is the process if you don’t have an account with TD and Fidelity? Is it all done online where you would gain access to my E*TRADE account, for example? How long does the process take? We’d have to have you open an account with Fidelity (which is part of our internal process) but then we’d transfer the assets in-kind from e-trade (no need for liquidation, and the account is in your name not ours). All the paperwork can be signed electronically, and the transfer to the Fidelity account would take 5-7 business days. Great article. Admittedly, it’s definitely something I wish I knew more about. I still have a hard time handing off my investment decisions to someone else (even a financial adviser/planner) but the day is coming when I’ll have to I assume. Optimizing for taxes is also something I haven’t really been worried about but as the value of my portfolio grows, I really should start.